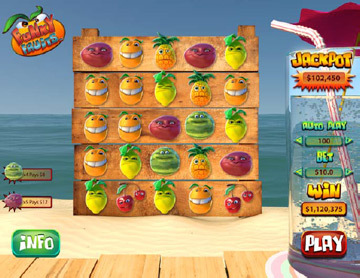 The object of Funky Fruits online slots is to spin the reels to reveal 5 or more identical fruit in a row either horizontally or vertically. The game is a quick fire game with loads of great dancing fruit including cherries, watermelon, lemon, orange, pineapple and plum. The game comprises a 5 by 5 grid with 25 fruit on it. When you press play the fruit will change to reveal 25 new fruit. You will get paid a fixed amount for revealing 5 or more identical fruit. 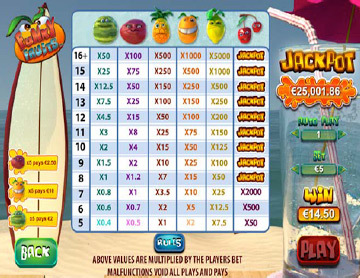 There is a great jackpot aspect to the game and you can obtain up to 25 of the same fruit. Anything above 8 cherries will win a progressive jackpot amount. This is a fun new game with great earning potential. There are also extra bonus features that can be activated to obtain respins and other prizes.